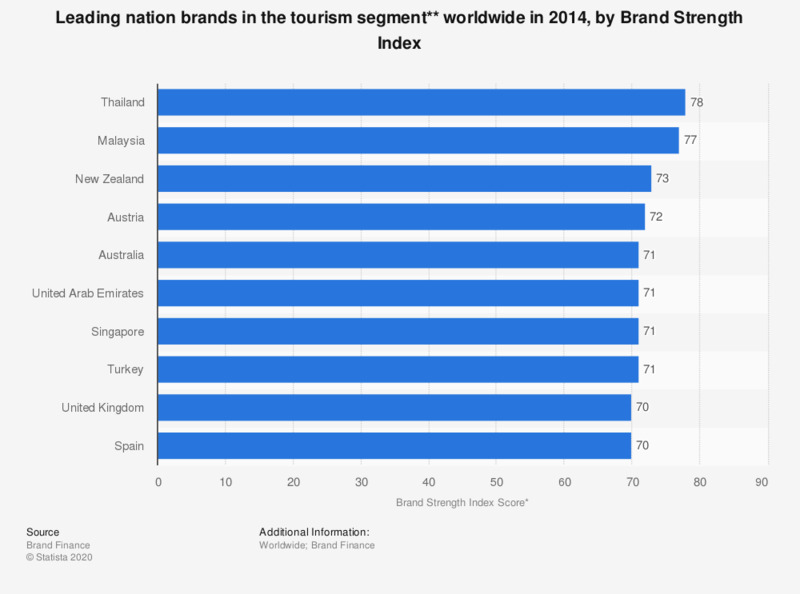 The statistic depicts the top ten nation brand performers in the tourism segment in 2014, measured by the Brand Strength Index (BSI). In that year, Thailand received a tourism segment BSI score of 78, higher than all other nations that year. The BrandFinance Nation Brands measures the strength and value of the nation brands of leading countries using a method based on the royalty relief mechanism that Brand Finance uses to value the world's largest companies. The report provides each nation brand with a measure of its brand strength and a valuation of its brand value. * A country's BSI score is combined with GDP data to arrive at the nation brand value- Looking at the BSI in isolation can therefore in some ways be seen to be the truest reflection of governments guidance of their nation's brands as the inherent GDP advantage of larger countries is removed. ** The Brand Finance Nation Brand Impact Framework identifies the 4 segments that enable countries to identify, build and unlock the potential economic value within their nation brand. These 4 segments (investment, tourism, products & services, people & skills) each have a crucial role to play in leveraging and improving a Nation Brand's ability to enhance GDP growth.